April Dinner Meeting in Murrieta! • For presentation description, meeting location, and other information. • For online payment and mail-in payment information. and Purchase Order Info. * Price represents a $5.00 discount if payment is received by the designated date. See information page for specific meeting early registration deadline date. 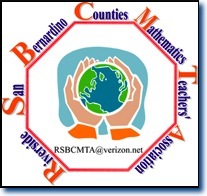 Welcome to the Riverside San Bernardino Counties Mathematics Teachers' Association Website. We are an affiliate of the California Mathematics Council (CMC) and the National Council of Teachers of Mathematics (NCTM). We serve teachers in both Riverside and San Bernardino counties. Please feel free to contact us for information. We welcome all new (and experienced) teachers! Please click on the subpages for specific announcements.